Long before the Sith and before even the Jedi were founded, beings from around the galaxy worshiped at altars erected to Krath. Krath began as a god to a primitive people, called the Tameht. Krath spoke to the finest of the Tamehtan blacksmiths, ordering them to create a talisman with which they could commune with their god more easily. The talisman was forged as Krath instructed, with a hexagonal hole drilled into the bottom of it. Krath then ordered the smiths to secure into the hole a crystal, that, unknown to the Tameht smiths, conducted and stored the energy of the Force. Using this talisman, these smiths became the Priesthood of Krath, and could now communicate with their god, and he with them. The High Priest alone could wear the talisman and communicate with Krath. As a succession of High Priests began to fall into insanity and apparent demonic possession, the Priesthood began to suspect that there was some flaw within the design of the talisman. After much mediation, they drilled two additional holes into the talisman and placed two more of the crystals into these holes. When no more High Priests fell victim to madness or demonic possession, the alteration was deemed a success, and the Order of the Krath continued for many generations. The talisman was passed down through generations of Tameht High Priests, and was passed to the Zfana civilization, after the Tameht tribe died out. After a number of centuries, the Zfana civilization was replaced by the Mhsanyata civilization, which rose to power only 12,000 years prior to the Battle of Yavin, and the talisman was passed on again. 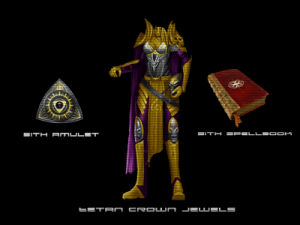 The High Priests of Krath during the Mshanyata civilization removed the crystals added by the Tameht, restoring the talisman to its original design, with the intent of freeing the true potential of Krath, which had been muzzled by the altered design over the millennia. About 4,000 years later, the Mshanyata had become a group whom their enemies regarded as soulless and possessed, and a rival culture rose, the Makalasa. During this time, Krath earned his reputation for evil, and the War of Five Thousand Days brought an end to the followers of the god Krath. The Mshanyata were destroyed by the Makalasa, and the Talisman was lost for millennia…until it was found by a Force-sensitive student of the Sith. Four thousand years ago, the Jedi were numerous and powerful throughout the Galaxy. But it was also a time when thousands of Force-sensitive individuals (including many who had the potential to become Jedi Knights) were succumbing to the Dark Side’s fascination. In those days, there was a star system called the Empress Teta System, after the woman warlord who, in the early days of space travel, had conquered and united its seven worlds. As the millennia passed, the Teta System, which is situated in the Deep Galactic Core, had become the prime source of Carbonite, a volatile metal that proved indispensable on the manufacture of faster-than-light engines (and secondarily, the suspended preservation of living flesh). The descendants of Empress Teta were still the figurehead rulers of the seven mining worlds. But they had been forced to share their power, to a large degree, with the commercial interests that had developed the Carbonite mines. Together, the Teta royalty and the wealthy mine owners formed an elite society, a tightly knit group that reigned with arrogant abandon over multitudes of the less fortunate. The sons and daughters of the elite were a self-indulgent lot, with much leisure time on their hands. As a way of amusing themselves, these young aristocrats began dabbling in the lore of primitive magic. At some point in their mischievous experiments, the young Tetans crossed an invisible threshold, and tapped into a form of magic that unleashed its malign mental reality with unexpected power. What had started out as a game suddenly grew serious, and took on a life of its own. In the weeks following that fateful day, this sinister power utterly shattered the minds of the young Tetan elite, and began to transform them into powerful magicians, but kept them willing servants. Under the guidance of Satal Keto, the first of their group to fall, the young Tetans formed a secret society dedicated to the dark arts. 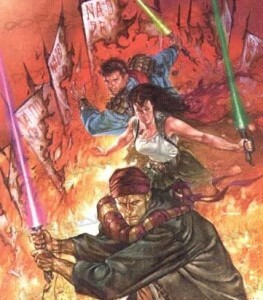 A Sith Lord named Freedon Nadd resurrected the legend of Krath, and trained two Sith initiates, Aleema and Satal Keto. They and their group of students took the name Krath in memory of the god of darkness that haunted the people. The youthful sorcerers had been ensnared and swallowed up by the Dark Side of the Force. Nadd used them to destroy King Ommin, the Sith heretic of Iziz, and begin his purge of the Jedi. The Krath became a feared presence in the Empress Teta System. For all the millennia that Priesthood of Krath used the talisman, it had always been wielded by beings that knew nothing of the Force, thus limiting the power of Krath. However, once it landed in the hands of Satal Keto, a student of the Sith, things changed. The young acolyte was convinced that the legendary talisman would, in his Force-sensitive hands, help him surpass the former High Priests of Krath, and become more powerful than his fellow students of the Sith. Along with Aleema, his cousin, he began to explore the powers of the talisman and began communicating with the god Krath. The Krath began building up a huge space armoury, which they used to conquer the Empress Teta system under Krath’s guidance. During this time, there was a man named Ulic Qel-Droma, who was a great Jedi warrior and Master of those days, pure of heart and purpose, without corruption of any kind. Some said he was arrogant, but those who knew him best said he merely possessed unbounded confidence, being very strong in the Ways of the Force. By the time Ulic Qel-Droma heard of the Krath, they were well on their way to their dark destiny, having surreptitiously murdered their own parents and staged a political coup, taking control of the seven Tetan worlds. This was a problem for the Jedi Knights, and it fell to Ulic Qel-Droma, as Watchman of the Teta System, to bring the Krath to justice. But it quickly became obvious that any attempt at arresting the Krath would result in great bloodshed. The Krath possessing their space-faring armies, and against every tenet of the Galactic constitution, they declared themselves ready to go to war against the Jedi. A Jedi assembly was called, on Mount Meru in the desert of Deneba, of the ten thousand Masters who had assumed primary responsibility for the core systems. 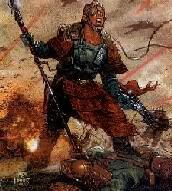 Ulic Qel-Droma argued strongly that war was unnecessary and absolutely the wrong way to deal with the power of the Krath: “We are witness to sinister developments…A war with the armies of the Krath might last for years. Many Jedi would die. And what will be gained by this bloodshed? We will have slain thousands, but the Krath themselves will survive, their dark powers intact. But Ulic Qel-Droma was convinced he had discovered the best way to conquer the opponents of the Jedi. And as Watchman of the Teta System, he had the right (and the obligation) to proceed according to his own judgment. So Ulic Qel-Dromna disguised his identity, and merged with the social life of Cinnagar, the largest city in the seven worlds. Eventually, after many months, he found his way into the friendship and confidence of the ruling elite. Ulic Qel-Droma became a Krath. What happened next is not completely known. 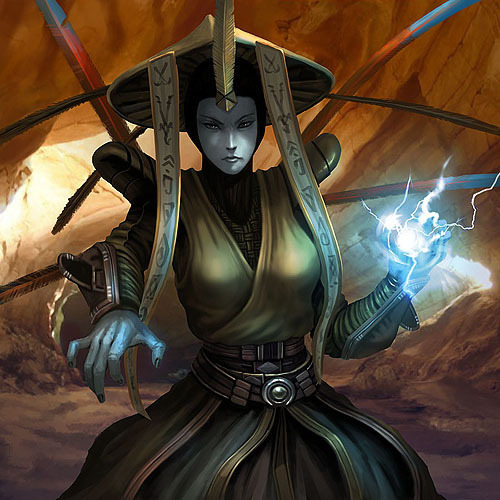 According to the Sith Holocron, Ulic Qel-Droma disappeared from view for a number of years. The other Jedi Masters tried to locate him, using all the mental powers at their disposal. But each time they attempted to penetrate the cloak of dark power that enveloped the sanctums of the Krath, they came up against “a wall of thought like blackest iron,” and could advance no further. Then without warning, Ulic Qel-Droma reappeared–as a high priest of the Krath. During the years of his disappearance he had been transformed completely, into a warrior magus with dark powers far beyond those demonstrated by any other member of the Krath! His reappearance coincided with a political struggle among the Krath leadership. The Krath split into three groups, one dominated by Satal Keto, the founder. Satal’s cousin Aleema, a woman whose Dark Side powers included the ability to create mass hallucinations, dominated the second group. Ulic Qel-Droma ruled the third group. Qel-Droma’s organization was militaristic and bloodthirsty. 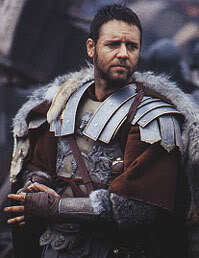 He set out on a path of conquest, gathering treasure, armies, and weaponry. In short order he possessed a vast fleet of faster-than-light warships that could swoop down unexpectedly on worlds in distant parts of the Galaxy…and quickly pillage their ruling cities. Needless to say, Qel-Droma was declared an enemy of the Republic…and Qel-Droma declared himself an enemy of the Jedi. As the Jedi Knights took action to protect the worlds threatened by Qel-Droma’s piracy, the Sorceress Aleema formed an alliance with Qel-Droma, using her wicked Dark Side talents against the Jedi with great effectiveness. The conflict that followed is remembered as an important historical turning point in the history of the Jedi Knights: it was the first war in which Dark Side powers were used on a massive scale, affecting the fate of millions.Even after Ulic slaughtered a conclave of Jedi Masters at Deneba, Satal Keto used an ancient ritual, and poisoned Qel-Droma, rendering him unable to betray the Dark Side. The former Jedi then took Aleema as his lover, and slew Satal Keto. This act cemented his position in the Dark Side, and he joined the Dark Lord Exar Kun as the commander of his war-fleets. Fate however, would bring this Krath low. Stripped of his power by vengeful Jedi Knights, Qel-Droma betrayed Exar Kun’s base of power on Yavin IV. Kun and his followers were promptly destroyed. It would be another thousand years, before the Sorceress Taimat, already half-insane, joined the Admiral Okemi and warrior Ferran, to found the Star Chamber. In a misguided reading of an ancient text, she developed a ritual to strip the light from a star, and rend it to pure entropy. In her madness, she lost control of the ritual, the Assassin slew her as the rite collapsed. Two of her surviving apprentices carried on what they knew of her magics and stored them in a holocron. 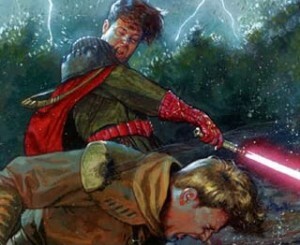 It was later found by the noghri Darth Xeres, also known as Thraken Solo. Together with his Nautolan apprentice Kal Fisto, they established the Order of Krath on year 5 day 103. The Order of Krath can be said to entail many beliefs and ways, and indeed in it’s very existence it at times defies logic. Both extremely complex and undeniably simple, the Order is like chaos it’s self, changing constantly. For this reason we will cover the general history of the Order and it’s various forms in our lifetimes. From the time of Thraken Solo, Self-proclaimed King of Krath, the Order has changed almost on a whim by it’s leaders. Initially, the Order accepted no new members unless they were invited and had both usefull skills and much experience. This changed to a system where one had to apply and be accepted by vote, but the skills and experience clause still held true. This was collectively the first era, marked by Thraken Solo’s guiding hand and the relative might of the Order, which surpassed several government forces. Though this system guaranteed a high quality among members, it was stagnant, and although the Order was strong, it was at the same time small. This Era saw the divergence of Sith and Krath belief systems and general hatred in regards to each other. Massive change came in what can be acknowledged as the 2nd Era, marked by the reign of first Mystiel Raleigh, and then Tapar Craken. This era saw what is seen now to be the great decline from former heights of power. The loss of both Thraken’s battle fleet and many veteran members meant the Order had far fewer assets of power, as well as few experienced members. The system gradually changed from one of loose confederation amongst the members to a standard military type, with units and officers commanding them, there were no more restrictions for those wishing to join. The Order’s roster was largely open to new members and veterans alike. In the beginning of this era, we have come to call it a dark age for the Order, largely powerless, lacking force projection, and lacking experienced members, the Order fought to stay alive. Gradually, and painfully, the Order rose from the ashes, one step at a time. What the Order lacked in a fleet was easily made up for in numbers. At one point, it was felt that any enemy that had to be fought could be drowned in blood in ground battles, rather then engaging in space combat. As time progressed, the system changed, and more power was built. Alliances were made, betrayals occurred, and gradually, the Order grew through pain and fire. Other aspects of this Era: The Invisible Army Heresy, the Alderaan Incident, The Minos Project, Tianlord’s Treachery, Thraken’s Death, and Mystiel Raleigh’s Death. It can be argued that the second era (begining with Thraken Solo’s retirement and ending with Mystiel’s death) and the third era (beginning at Mystiel’s death) are largely the same, only marked in difference by a change in ownership from Mystiel Raleigh to Tapar Craken. There are, however, marked differences between the two era’s, though they are incredibly subtle. First is the decline in overall active strength of the Orders combat arms, and a change in focus to the civil arms of Astaroth, and then Minos-Mestra Munitions. The key marker at the beginning of this period is the Mayagil conflict, which was a shock strike at imperial control of the Mayagil Sector. Brief, and initially successful, the speed with which Krath forces moved shocked imperial forces, slowing their response time, and ultimately, lead to the conquest of the sector by Krath and Sorosuub forces, and the full scale (and entirely peaceful) withdrawal of Krath units. From that time, the new philosophy for the Order has been the building of it’s power base, the exclusion of almost all else. Politically strong, Frezt Raleigh was elected as President of the Kathol Republic. Krath’s influence grew. When Grandmaster Tapar Craken went traveling to unknown regions, Frezt also took over leadership of the Krath. The Imperial puppets under Blastech’s banner started an invasion in the Hoth system and Shesharile system. The Krath fought back in Shesharile and assisted the Kathol Republic’s forces in Hoth trying to repel the imperial invaders. Meanwhile, Frezt was more and more consumed by Krath, until he could no longer neglect Krath’s will. 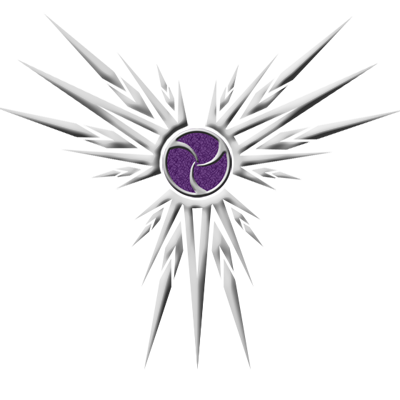 Together with the Krath Council they developed a new governmental body to who the Order and the Kathol Republic transferred their powers to. The Kathol Republic seized to exist, the Order remained a well respected part of something bigger, the Krath. Events of the Third Era include: The Mayagil Conflict, The Formation of Minos-Mestra Munitions, The Plundering of HCE, The Outpost Project, The President Elections, The Grandmaster’s Trip, The Hoth Invasion, a new era for The Krath. The Krath still stands for Krath’s core values. It’s like chaos it’s self, changing constantly, but at the same time as constant as a government needs to be. In theory a Theocracy, it’s leader is possessed by Krath and his council highly devoted. The government consists of a mix of former Kathol personnel and members of the Order. Through the Krath take their role in governing their people very seriously, privateers are still employed by the Krath, as are the smugglers. Events of the New Age: The Shesharile Celebration.